Microsoft today announced the preview launch of a new family of virtual machines for its Azure cloud computing platform that’s specifically geared toward bursty workloads. Microsoft argues that these so-called B-series machines, which are currently the lowest-cost Azure machines with flexible CPU usage, should work well for workloads like web servers, small databases and dev/test environments. The principle behind these B-series machines is similar to AWS’s T2 instances in that they offer burstable performance and that you build up credits for the periods when you don’t need the full power of the virtual CPU. Google offers a similar machine type with its f1-micro and g1-small instances. This scheme of letting you bank credits as your machine idles (or only needs very little CPU power) means you end up saving money over using a traditional VM, but still get access to enough power when you need it. Microsoft will offer six different versions of these B-series, starting with a single-core VM with 1 GiB of memory for $0.012 per hour, up to an eight-core machine with 32 GiB of memory for $0.376 per hour. 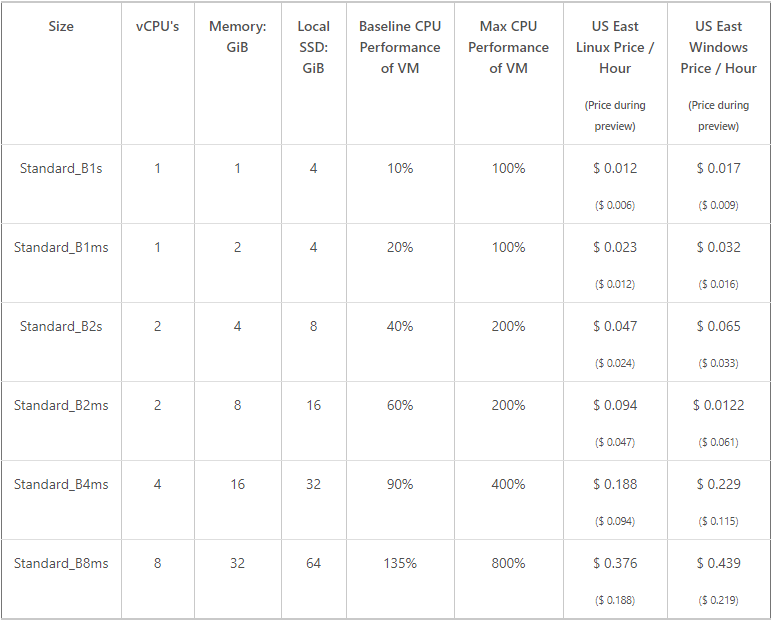 These are the prices for Linux-based machines, with Windows-based machines — as usual — costing a bit more. During the preview period, developers get a 50 percent discount on these prices. For now, these new machine types are only available in two U.S. Azure zones (West 2 and East), Europe (West) and Asia Pacific (Southeast). Developers who want to try them during this preview period also need to put in a quota request.